We're blanketing Maine with these flyers! 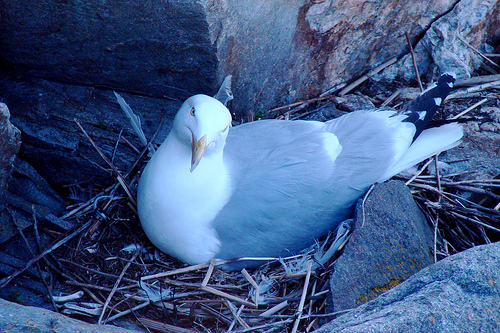 The National Fish and Wildlife Foundation has awarded SEANET a grant to study seabird mortality in Maine. 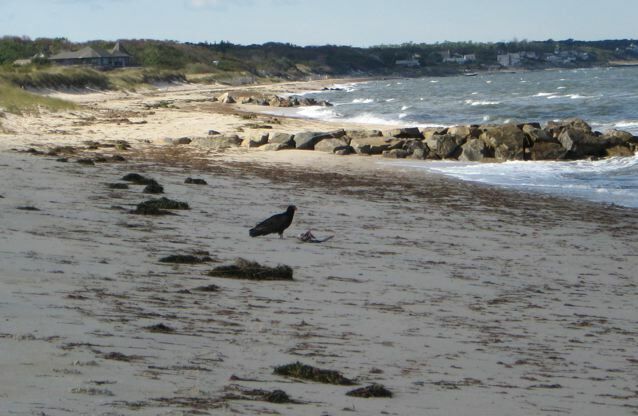 The data collected by walkers on the Maine coast will be used to establish a baseline against which future mortalities due to oil spills can be accurately measured. To accomplish this, SEANET needs to expand to many, many more beaches in Maine. For this study, we ask volunteers to commit to walking once a month for a full year. 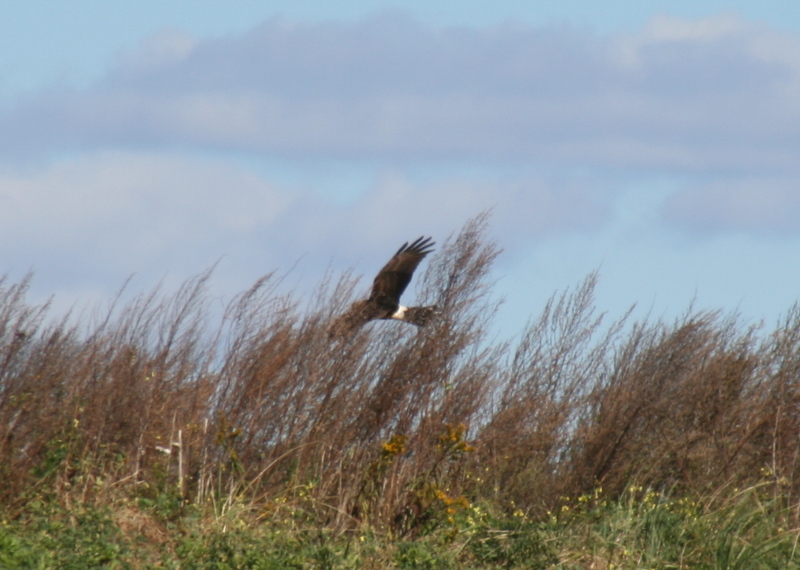 Northern Harrier over a SEANET beach; you too could see such sights. Join us! After that point, all are welcome to stick with us and our larger project, or head off for greener pastures with our heartfelt thanks. So if you, or anyone you know, live in Maine and would be willing to participate, or even just to distribute our flyers to libraries, nature centers and the like, please let us know! We’re looking forward to hearing from you! Hundreds of seabirds inundated wildlife rehabilitation centers in the Pacific Northwest last week after a bizarre run-in with marine algae. The single-celled organisms implicated in the incident are common in the waters off the coast of California, but are usually not found as far north as Oregon and Washington. Warmer than usual ocean temperatures may have permitted the algae to reach more northern regions. Extraordinary numbers of the algal organisms were churned up by stormy weather coming south from Alaska, and a protein produced by the algae turned into a frothy foam that proved fatal to seabirds. 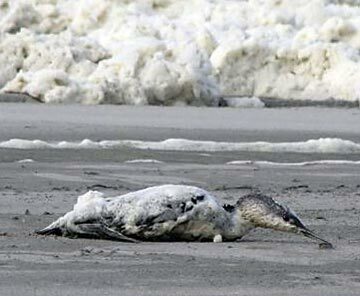 Just as oil strips bird feathers of their waterproofing ability, the foam produced by the algae deprives the birds of the ability to keep cold ocean waters from soaking through their plumage, leading to hypothermia and death. The affected birds, mostly Common Murres, loons, scoters and grebes, are being treated in rehabilitation centers until their waterproofing is restored. The International Bird Rescue Research Center (IBRRC) in northern California stepped in to help in the efforts when rehab facilities in Oregon and Washington were overwhelmed. You can learn more about how the surviving seabirds are being treated and how you can help at IBRRC’s website. Yesterday, we presented the opportunity to sport a fabulous SEANET t-shirt by donating to the program. 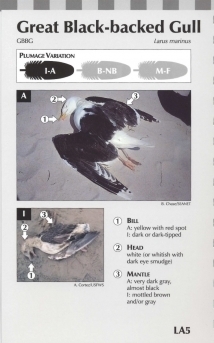 For those of you serious students of dead birds, we offer the Beached Bird Guide. It is indispensable for those who want to try to identify those mangled bits of birds strewn across the beach. With helpful hints on i.d. based on plumage and body measurements, it will enrich your Seanetting experience. The guide costs $31.50, and we ask $4.50 for shipping, for a total of $36. What a deal! You gain knowledge, and we gain funds. It’s a win-win, Seanetters! SEANET fund drive: our gift to you! Perhaps you’re thinking, “SEANET fund-drive?! No handouts for seabird mortality projects, that’s what I always say!” Well, for those of you opposed to straight-up donations, we have a token to offer in exchange. For a donation of $24, we will send you a SEANET t-shirt (available in blue, gray, or white) as our thanks. We’re no freeloaders here at SEANET; we’re willing to work for the money! So send your check to the address listed in yesterday’s post, and send an email to sarah.courchesne@tufts.edu with your desired color and size and be a part of SEANET’s very survival! Check out the “Shop” tab above for a closer look at the shirts. Thanks! You could look this spectacular too--get a SEANET t-shirt! SEANET fund-drive: could you say no to this face? We’ve set the absurd goal of $5,000 raised by Friday evening. Lofty and ambitious? Yes! SEANET is bold! So give early and give often! And, if you’re desperate for some seabird content, please head over to The Gulls of Appledore for the latest banded gull re-sighting! 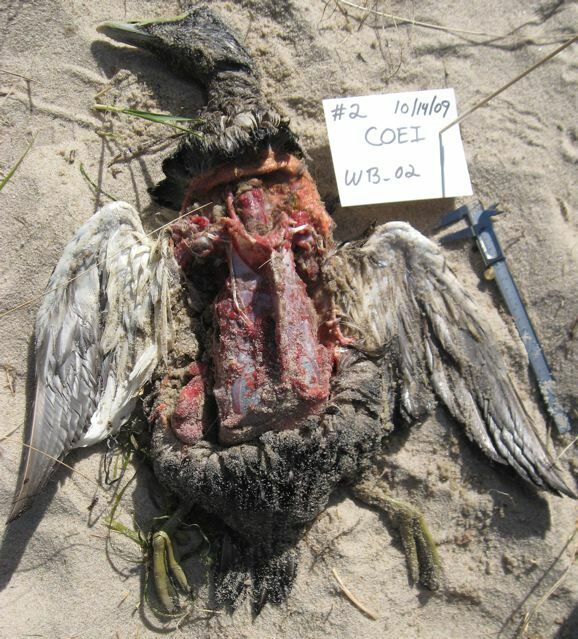 As the fall progresses and the days grow colder here in New England, Cape Cod beach walkers are greeted with what is now a familiar sight: dead Common Eiders (mostly males) littering the Bay side shores. These events are also common in Spring, and details on the last one in May were presented in an earlier blogpost. This time, the area involved is almost identical to that in the May event. Seanetters Bud Johnson, Steve Gulrich, Diana Gaumond and Mary Myers all reported dead eiders on their walks last week, and kudos to them all for marking the carcasses with our orange SEANET cable ties–for the first time we have a good shot at a definitive number of birds found by Seanetters, and we will at last be able to determine if new carcasses are showing up while others wash back out to sea, or if the same birds persist on the beach for some time. So far, the 50-100 birds reported have been variously scavenged and decomposed. If any fresh carcasses turn up, SEANET is in a position to receive them and submit them for testing. We have also received reports from observers of live eiders who say rafts of up to 2,000 or so of the birds have been hanging out in the Bay near where the dead birds washed up. With such a concentration of live, migrating birds, it is unclear whether the current mortality is a true “die-off” or merely the normal background mortality in a large, highly concentrated population. We hope to get to the bottom of this mysterious, recurring phenomenon eventually, and we thank Seanetters and affiliated friends for all the reports and information you have sent our way. We welcome all reports on Common Eiders out on the Cape, live or dead, so keep your eyes open and your boots on the sand out there! Check out SEANET on facebook! UGA veterinary student Katie Haman during her loggerhead turtle study. See more cool photos at the TCCM facebook page! Tufts Center for Conservation Medicine (of which SEANET is a part) has started up a facebook page and they have included photos of Seanetters and some of the vet students who have worked with us over the past couple of years. I know some of you are technophobes, and others of you are probably already facebook addicts (as is, admittedly, your SEANET blogger.) If you are already a facebook member, just go directly to the TCCM page. 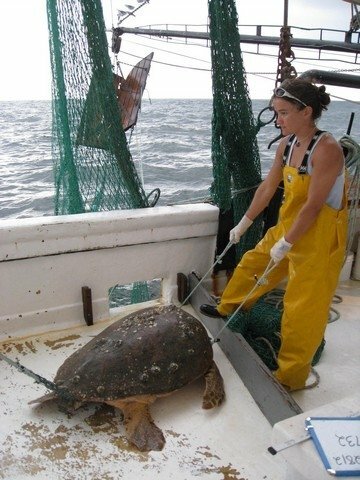 Aside from SEANET, there are some very cool photos of veterinary student projects involving bears under anesthesia, sea turtles hauled on board vessels for study, and information on the new Master’s Degree in Conservation Medicine that Tufts will soon be offering. We want to spread the word about the latter in particular, so tell all your facebook friends and your regular friends! If you aren’t already on facebook, it’s easy to sign up, and your SEANET blogger would be happy to be your facebook friend.